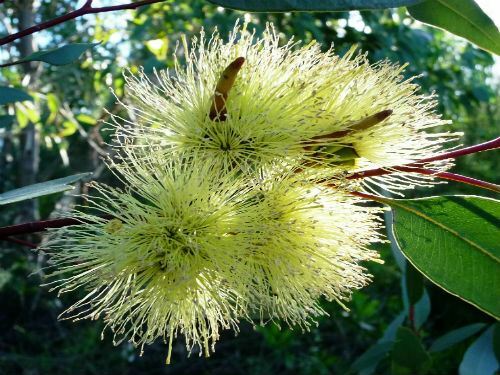 Eucalyptus macrandra, Long-flowered Marlock, is a mallee from 4 to 10 metres tall. Plants often produce multiple trunks that grow from a large lignotuber (swollen root mass). In our garden specimens confine their growth to one trunk. The bark is smooth, light brown and is shed in long strips then ages to grey. The leaves are thick, bright green, lanceolate and up to ten centimetres long by three centimetres wide. The flower buds are in clusters of up to 30. They are long, up to 4 centimetres long and narrow, 0.4 centimetres wide and horn-shaped. The flowers form large clusters, yellow to yellow-green and are both profuse and conspicious. Flowering occurs from December to March. Honeyeaters are attracted to the flowers. Fruits are cup-shaped. E. macrandra is a handsome small tree. Bark, buds and flowers are attractive features. It could be grown as a specimen plant or as a component of a tall hedge. The Long-flowered Marlock occurs in southern Western Australia.